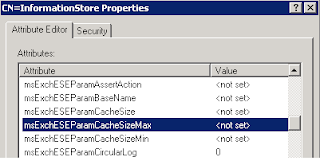 By default,, Microsoft Exchange Information Store uses a lot of memory for caching. 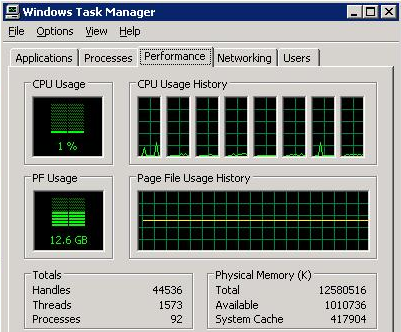 According to Microsoft, database cache can reduce I/O operations. 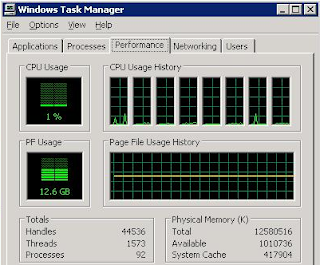 In order the achieve the improvements is disk I/O performance, store.exe which runs the ESE database engine consumes as much RAM as it possible can. 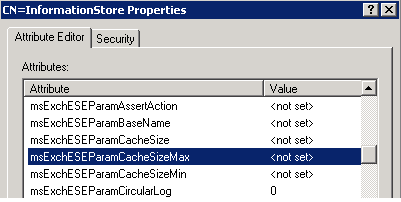 We﻿ can modify the following Active Directory property to control the maximum database cache size. Assuming that the domain controller is installed Windows Server 2008 or Windows Server 2008 R2. 6. 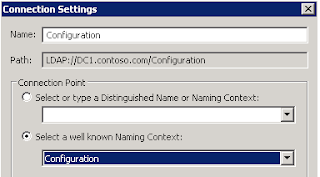 Expand "Configuration > Services > Microsoft Exchange > <Organization Name> > Administrative Groups > Exchnage Administrative Group > Servers > <Server Name> > InformationStore". 7. Right-click "InformationStore", select "Properties". For instance, if you want to limit the Database Cache to 4 GB of an Exchange 2010 server, set msExchESEParamCacheSizeMax to 131072 (4 GB = 4.194.304 KB / 32 KB). If you want to limit the Database Cache to 2 GB of an Exchange 2007 server, set msExchESEParamCacheSizeMax to 262144 (2 GB = 2.097.152 KB / 8KB). 12. 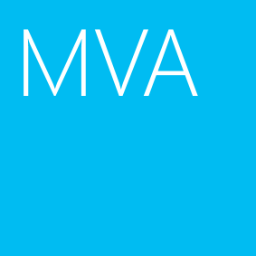 Restart the Microsoft Exchange Information Store service of the mailbox server. Remark: msExchESEParamCacheSizeMax attribute is per server setting.